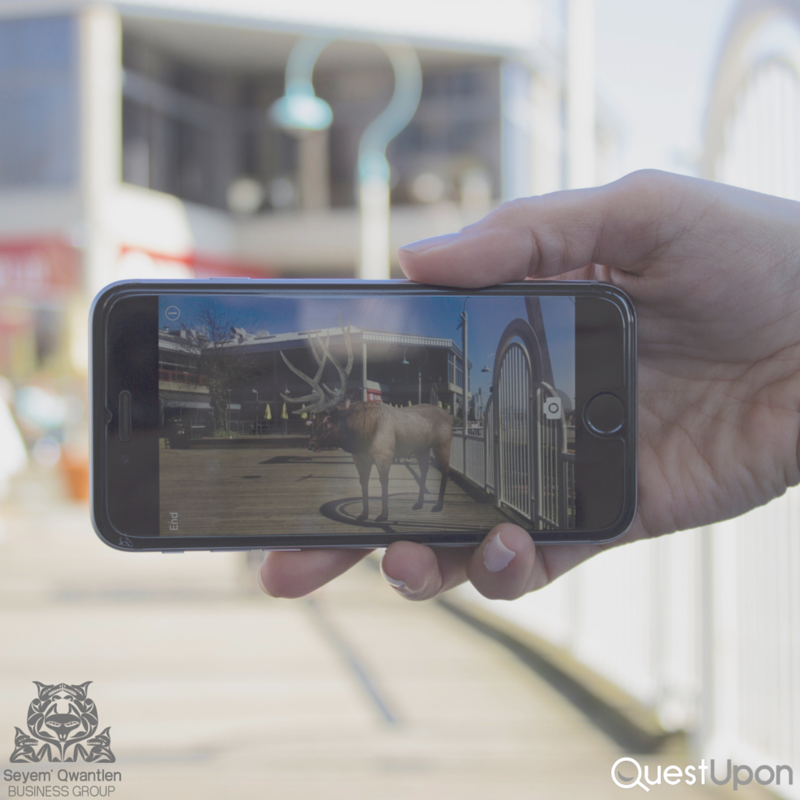 Seyem’ Qwantlen Business Group of the Kwantlen First Nation, and award-winning augmented reality tech company, QuestUpon, held an event on April 15th, 2016, to launch the very first interactive First Nations storytelling quest, titled “The Tireless Runner”. 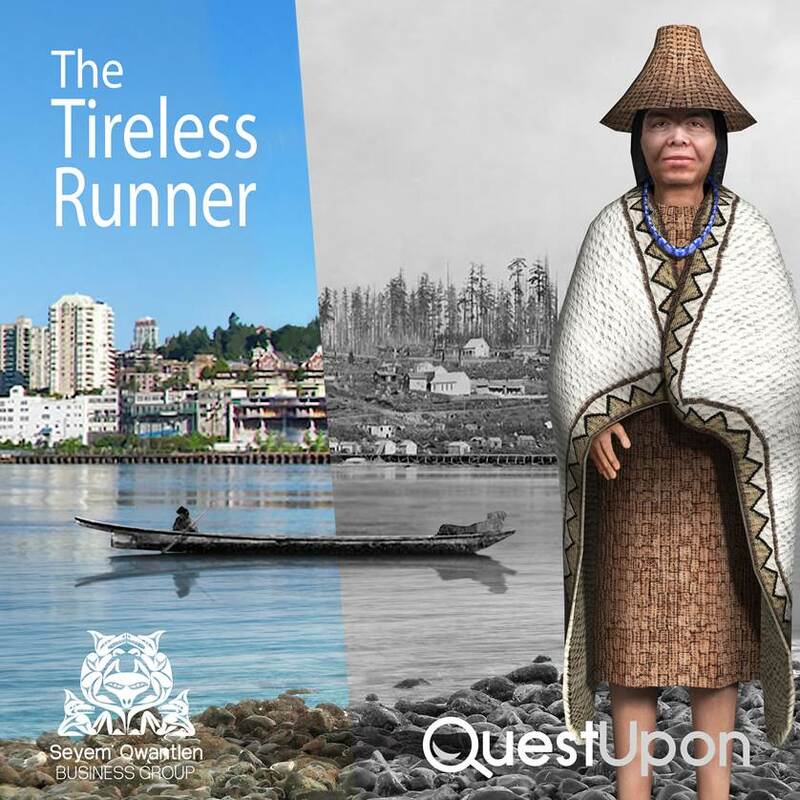 The quest launched at this event, "The Tireless Runner", (translated from the hən̓q̓əmin̓əm̓ word q̓ʷa:n̓ƛ̓ən̓, or 'Kwantlen’), starts out in the 1800’s by meeting the narrator and historic figure Chief Whittlekainum of the Kwantlen First Nation. It’s a historical tour that takes the user on a self-guided path along the New Westminster Quay. On this quest they will learn about the Kwantlen Traditional Territory, interact with characters of the past, see animals of importance, learn about pivotal stories with Simon Fraser, “time travel”, embark on a scavenger hunt, and more. QuestUpon logo Seyem' Qwantlen logo Kwantlen First Nation, 'The Tireless Runner' quest, by QuestUpon.The Tireless Runner quest is ready to take you on this Kwantlen First Nation historical walk. Get started by downloading the free app, ‘QuestUpon’, on iPhone or Android. Augmented reality on The Tireless Runner quest.Here's a view of an elk. This is one of the 3D augmented reality missions that you'll see on The Tireless Runner quest. Learning about Kwantlen First Nation history, Traditional Territory, important animals, and more.